Whether you are trying to restore a table with a warped top, figure out why your cabinet or passageway doors are warped, or you’re a woodworker looking to fine tune your projects, understanding what causes panels to warp and how to prevent it can be the difference between getting it done and getting it right. When working with solid wood or plywood, preventing panel warp is possible. Although solid wood and plywood have inherent differences the fundamentals are the same. Panel warp can be caused by the materials, construction, processes, or environment. Materials: The right materials are crucial for flat panels, whether they are solid wood or plywood. Solid wood –> Keeping solid wood panels flat requires lumber that is dried evenly throughout and that has minimal drying or natural stresses. The image below illustrates that we are looking for materials that are consistent throughout. 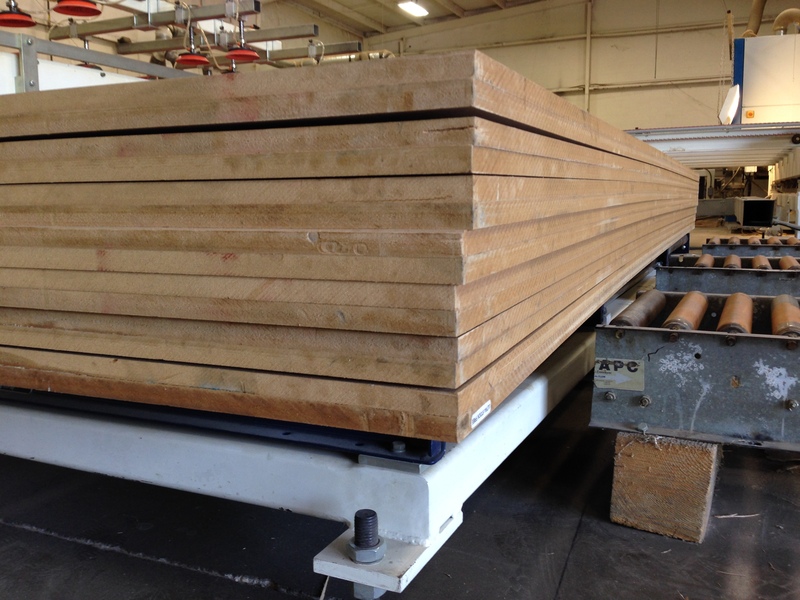 A harsh and short drying cycle can cause a variety of issues, but when selecting a lumber supply to make solid wood panels avoid one that over dries the outside of the board and leaves the middle still wet. With the red shaded areas being overly dried and the blue regions being wet avoid lumber that you run across that isn’t consistent. Keeping the components narrow and square (faces 90° to one another, not necessarily the shape) will also help. Plywood –> Like the components in solid wood panels, the ply materials for the plywood panels need to be of the same moisture content. Using blue for wetter and red for drier again, the plywood on the top shows plies that are pulled from stock that is the same moisture content while the example on the bottom shows plies varying in dryness. Construction: As a rule of thumb, the overall thickness of a panel construction is straight forward; the thinner the panel the more responsive the panel will be to the factors causing warp. However component orientation is more complex and the best practices vary between solid and plywood panels. 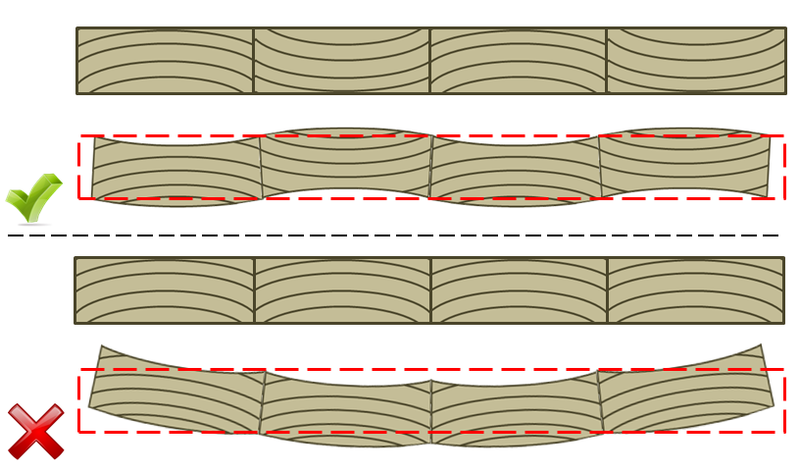 Solid wood –> Alternate growth ring arc direction to reduce the effects of the accumulating dimensional change in wood between components as it takes up and releases moisture. Below are 4 examples of edge glued panels. The top of each section shows the grain orientation of the panel when gluing, and the lower shows how it will move as the panel dries. Expect the opposite movement if the materials are introduced to a more humid environment. The greater the humidity change the greater the exaggeration. Notice that the average distortion of the panel is the same in both examples, but the distortion above and below the dashed line that represents the original panel is greater in the panel that was glued up with the growth rings all facing the same direction. This also helps to illustrate why narrower components will help to keep flatter panels. To better visualize, think of the panel as a wave. By shortening the distance between the peaks or valleys you will reduce the height of the wave, even if with the same amount of energy or in a panel’s case dimensional change. 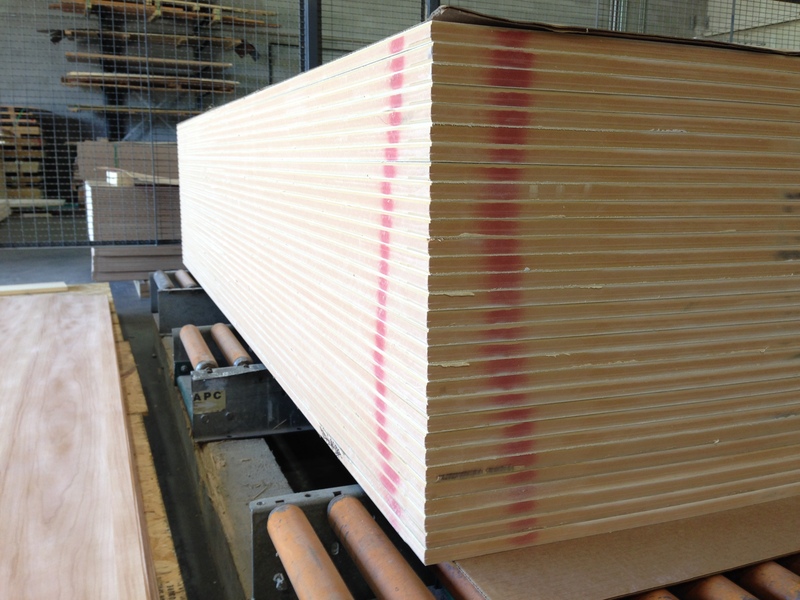 Plywood –> Symmetry of layers is critical to balanced plywood panel construction. Layers that are mirrored through the center of the panel in material, thickness, and grain direction will produce a balance a plywood panel. The variables of material, thickness and grain direction all directly affect the forces exerted on plywood, a balance between the forces on one side and the other directly affect the flatness and stability of a panel. If a balanced panel is exposed to the same environment on both sides it will remain flat. The example below shows a balanced and unbalanced construction. 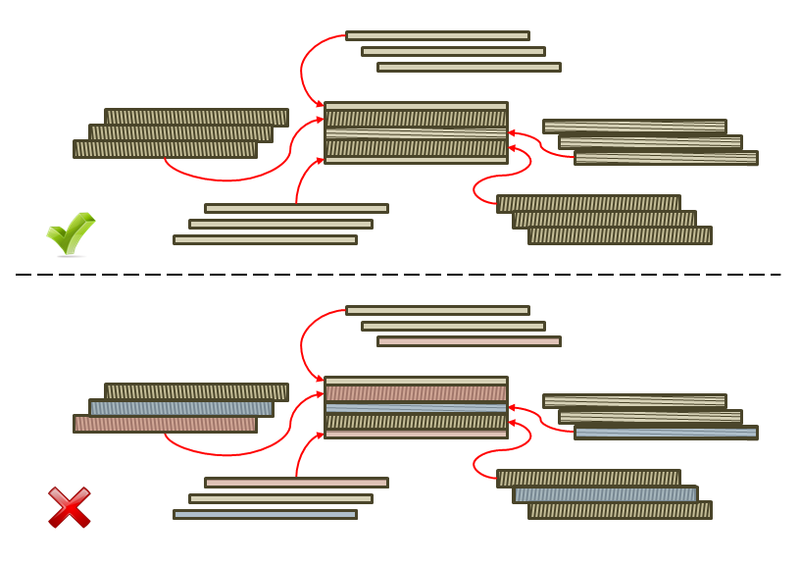 Notice that the layers are mirrored in grain direction and thickness. As the moisture changes in the lower panel the top half will not match the forces on the bottom half and the panel movement will be controlled by the stronger of the 2 forces. Processes: Processing done to one side of the panel should be done to the other; drying, machining, or finishing. Solid wood –> When surfacing panels to thickness, after gluing, remove the same amount of material from both sides. If the project requires finish, finish all sides, and edges; the finish application quality does not have to be the same, but simply sealing the panels will go a long way to keeping them flat. Ideally one would apply the same coatings to all edges and at the same thickness, but seal the less critical edges at a minimum. Plywood –> All aspects of solid wood processes apply to plywood with some additions. Apply the same glue with the same thickness of spread to both sides of the panel when laying up, and then allowing both sides to dry evenly. This should not be an issue as long as the panels are left under pressure until the glue is completely cured. When hot pressing the panels, it is also good to consider the rate at which the faces of the panel are cooling and drying. When stacking panels as they come out of the press you may notice that the top and bottom panel are cupping away from the rest of the stack. Something as simple of a sheet of cardboard on the bottom and top of your stack will greatly reduce the amount of movement of the panels. The images below show how big of a difference a piece of cardboard can make to the top and bottom panel. Environment: Environmental conditions, specifically related to the movement of water, are the one constant that affects all aspects of wood stability and movement. Even panels with ideal materials, construction, and processed according to best practices can cause problems when introduced to a highly variable environment. Avoid placing panels in extreme environments, like near heaters or humidifiers. Avoid using in applications where they are a barrier between humid and dry spaces. Store panels with the top and bottom of stack covered. Just as seen in the hot press panel example above. This slows the movement of water through the exposed face to better match the movement of water from the panels in the middle of the stack that seem to stay flat. Allow panels to acclimate before processing whenever moved from an extreme environment. This includes when taking panels you bought out off the truck in the winter into a heated shop. For similar articles Wood + Science. “Statistical Data ?? It makes sense but what ranges and variation are optimal and detrimental.” Comment from Mike, a reader on LinkedIn. Excellent question and I’ll tackle this on future writings. Thanks for the feedback. “Good simple overview. I would add presence of reaction and juvenile wood. It is quite often present in plantation Pine products. The shrinkage rate is higher than mature wood and that will cause warped panels.” Another comment from a reader on LinkedIn. Important additions; nearly an article in itself. Thanks Andre!